Prevention, treatments, and the physiology behind common gymnastics injuries. Keeping the arm in the same position for a prolonged period of time, especially overhead positions (such as prolonged hanging, handstand holds/training, one-arm supports, etc). Placing force through the arm in an overhead position (velocity and intensity play a factor). Poor coordination/weakness of the shoulder muscles during movement (this is known as scapulothoracic rhythm – the so-called pairing of the shoulder blade’s motion with that of the humerus). Often shoulder “impingement” is cited as a cause. While this can be the case, it is not the belief of this author that impingement is a true diagnosis. Shoulder impingement is defined as “the pinching of the subacromial structures, such as the rotator cuff, bursa, and surrounding nerves/vasculature, between the humeral head and acromium with movement.” After extensive study, I feel the term impingement actually refers to “a narrowing of the subacromial space by inflammation and poor glenohumeral mechanics.” That definition leads me to think that rotator cuff tendonitis is actually the cause of impingement. And yes, general overuse (a sudden increase in training or the addition of a new skill) is no doubt a cause. Generally, pain occurs with overhead activities and lifting your arm to the side. Pain is more likely in the front/top of the shoulder and may radiate to the side of the arm (traditionally the lateral/posterior aspect). However, this pain ALWAYS stops before the elbow. If the pain travels beyond the elbow, this may indicate a pinched nerve or more serious pathology. The pain may be worst at the beginning of an activity and then “ease off” as you warm-up. This is because the tendon and muscles get more circulation and the inflammation is pushed away. Often though, there will be an increase in your pain toward the end of or after the activity. This “after” pain can last into the next day. There may also be pain with lowering the shoulder from a raised position. 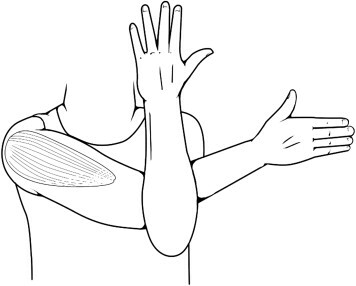 At first, this pain may be mild and occur only with certain movements of the arm. Over time, pain may be present at rest or at night, especially when lying on the affected shoulder. As the pathology progresses, weakness can develop and sometimes a secondary loss of motion is apparent. The shoulder will be stiff at rest and the skin around the shoulder will become tender to palpate. Simply put, tendonitis is a new or recent injury. The tendon has recently been injured or overused, and the inflammation is new. There is no long-term or permanent damage and the affected tendon can fully recover if rested and the causative factor is removed. Tendonosis is chronic (long-term) degeneration of the tendon. It basically means that the tendon is diseased. The tendon is breaking down and is at a greater risk for tear (due to microtrauma and small fiber tears). Tendonosis usually occurs when tendonitis does not resolve (something to think about when you’re “pushing through the pain”). With tendonosis, the tendon may no longer be inflamed, but rather it can be re-aggravated and turned back into a tendonitis. This “recurrent tendonitis” is often more painful and of quicker onset than the original tendonitis was. Here, you can pass from 1 to 4 in a progression, or pass back and forth from 1, 2, & 3 which will eventually get you to 4, or in the rare case, you can encounter sudden trauma and just be a 4 (sudden rotator cuff tear). In gymnastics, most rotator cuff tears are gradual, the result of slow and repetitive degradation of the rotator cuff tendon over weeks, month, and years. As in all things, think RICE for the rotator cuff when you suspect an early tendonitis. Rest: I know, you’ve got a show/meet/big thing coming up, but ultimately this isn’t up to you. If you’re having these symptoms, your rotator cuff is telling you that there is a problem. Initially, try reducing the number of skill/routine repetitions and focus on drills to strengthen the body (conditioning works great as long as it’s not over-dosed). If that’s not enough and after 1-2 weeks you’re still having pain, STOP the offending activity for a few days. Then re-introduce it on a LIMITED basis (2-3 reps a practice and build back up). Ice: This is a must! After ANY activity that uses the arm sit with ice on it for 15 minutes. (and this can include even the non-athletic pursuits of housework and personal hygiene). The cause of tendonitis is inflammation, and though the rotator cuff is deep in the shoulder, just decreasing the flow of blood to that area (the arterial vasculature narrows in response to cold) will give the lymphatic and venous system a chance to pull out some inflammation. Plus, ice cools the nerves down and numbs them (by impeding the pain signal up the nerve). As a nerve cools down, it becomes less effective at sending signals. Plus, the nerve that carries pain also carries temperature – and it can’t carry both at the same time. (This is known as the “Gate Theory of Pain.” Think of 495 at rush hour. All the cars want to go, but they can’t all fit.) Since temperature is the faster of the two signals, pain has to sit this one out. Compression: You can try to compress and support the rotator cuff, but this doesn’t usually work well with gymnastics. The bracing is bulky and severely limits mobility – so just skip this for now. Elevation: Not something you need to worry too much about since the rotator cuff is above the heart in sitting. The reason we elevate is to help gravity push the inflammation (a.k.a. swelling) back to the heart so it can be removed from the body. That said, it may be more effective to ice while sitting in a chair. You can also rest the affected arm on a desk/table to “open” the shoulder joint a little and allow some more room for circulation. Now that we’ve got the treatment started, the next step in the process is stretching and strengthening. Even though it’s the tendon that is inflamed, the true cause it the musculature – so that’s what we have to re-educate. There are many ways to go about this, but I recommend starting with the basics and working up. The focus in the beginning should be on stretching out the anterior shoulder muscles (pectorals, biceps, and anterior deltoid) and strengthening the posterior shoulder and postural muscles (rhomboid, teres minor, infraspinatus, middle, and lower trap). This will help to put the rotator cuff in the ideal position, and also help to improve scapulothoracic rhythm. Below is the introductory level. (this is also listed as a separate blog – Beginning Rotator Cuff Exercises). Start here and progress to the intermediate and advanced levels after a few weeks of continuous exercise. 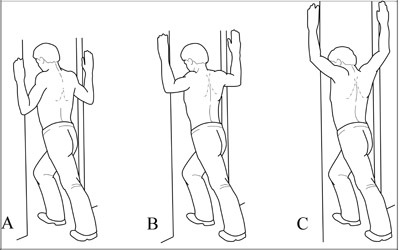 Standing in a doorway, place your arms on the frame (the shown positions A, B, and C all stretch a different portion of the pectorals). With one leg in front, step through while keeping your head and chest up. You should feel a stretch across your chest and into the front of your arms. Hold for 30 seconds. Perform 3-4 times a day. Grab the back of the arm and pull it across the chest until a stretch is felt in the back of the shoulder. Hold for 30 seconds. Do 3-4 times a day. Shrug the shoulders up and backward and then relax down and forward. The goal is a backward circling motion. Do 10-20 times, 1-2 times a day. Standing, slowly bring the arms back and squeeze the shoulder blades together. You should feel a stretch across the chest and muscle contraction between the shoulder blades (postural strengthening). Hold for 10-15 seconds. Do 5-10 times, 1-2 times a day. Using the resistance band (choose a color that allows you to complete the full sets with mild-moderate difficulty). Perform 2 sets of 10-15 repetitions in a PAIN-FREE range of motion. Do these 3 times a week (and never before practice – always on off days or after). External Rotation: Stand facing to the side with the arm across the stomach. Keeping the elbow still and at your side (think of it as the hinge on a door) pull the band out. Be sure to keep the elbow bent to 90 degrees throughout (so only go as far out as you can without breaking form). Return the arm to the starting position slowly. 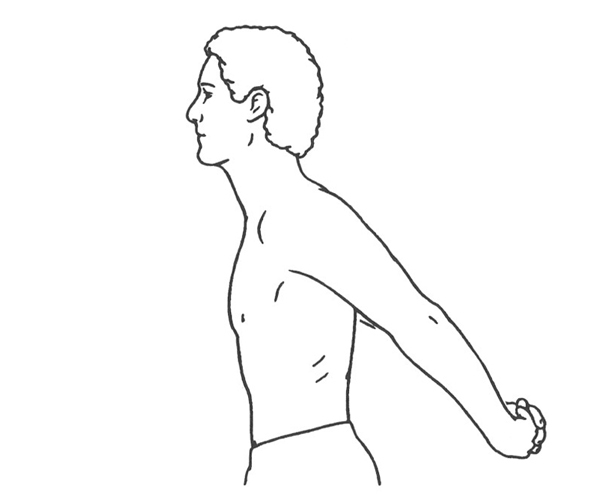 Abduction: Stand facing the side with the band anchored across the body. With the elbow bent, raise the arm out to the side. If more of a challenge is needed, perform with the arm straight. Only go as high as the shoulder. Return slowly. Rows (labeled extension): Stand facing the anchor-point of the band. With the arms bent, pull the hands STRAIGHT back against your sides as you pinch your shoulder blades together. (Think of sliding your hands across a level table). Internal Rotation: Stand with the band to your side, elbow bent to 90 degrees. Pull the arm in to your stomach. Again, keep the elbow in one place (think of it as the hinge on a door) and rotate the arm around it. Return slowly to the starting position. Good posture puts the neck, head, shoulders, and thorax in the ideal position for muscular efficiency. It also ensures that the weight is distributed correctly and that the forces placed on each structure are tolerated. While gymnasts tend to have good standing posture, they also spend a great deal of time strengthening positions that are not (such as hollow body – which involves significant scapular tipping and protraction – a.k.a. pulls it up and forward). These “alternate postures” often put the traditional postural muscles on stretch (in a weakened position) and can alter muscle function with arm movement, so some basic postural training and practice is a must. The head is aligned and looking straight ahead with the ear over the lateral shoulder. The arms are relaxed at the side and the weight falls through the hips, just behind the knees, and over the balls of the feet. There is also even weight on both feet. Pain medication can be useful if the pain is so severe that it limits your regular (non-gymnastics) activities. If possible, use an over the counter NSAID to help decrease inflammation further. Be sure to only use the recommended dosage, take with food, and do not do so for more than a day or two (unless recommended by a doctor). 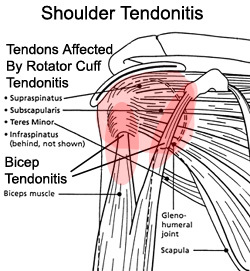 Rotator Cuff Tendonitis is an acute irritation of the rotator cuff tendon. It is caused by overuse, poor posture, repetitive overhead motion, and poor scapulothoracic rhythm (muscle weakness and poor coordination of the scapula and humerus with arm movement). Treatment involves: rest, ice, stretching, and strengthening. A focus on good resting posture is also important. NSAIDs (like Motrin, Advil, and Aleve) can be used intermittently (and as recommended by MD) for pain and management of inflammation. This entry was posted in Rotator Cuff, Shoulder on September 29, 2012 by Angie.